When I was sorting through my mother's house after her death last year I came across these two photos from JRGS school days. 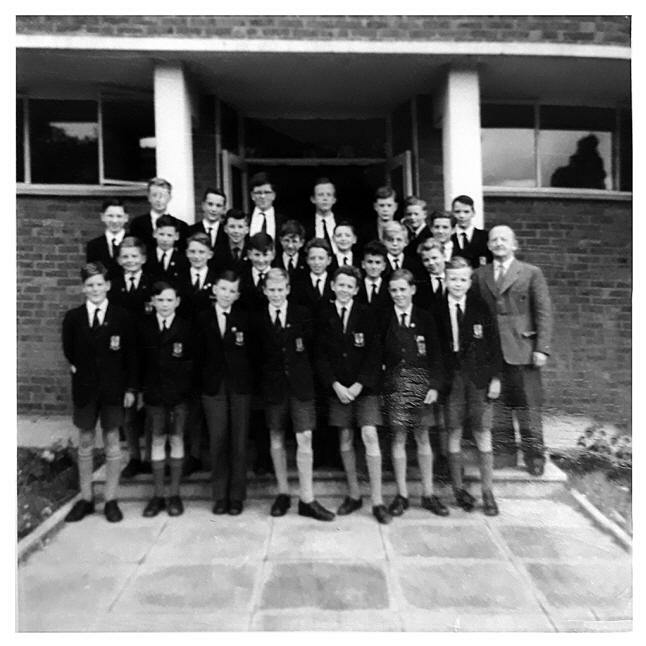 One is a class photo of Form 1H with Mr. Hancock, and the other taken in Class 5U by Tommy Thompson. They brought back fond memories which I had completely forgotten about! Click on either image taken in the rear quadrangle to view a larger version. 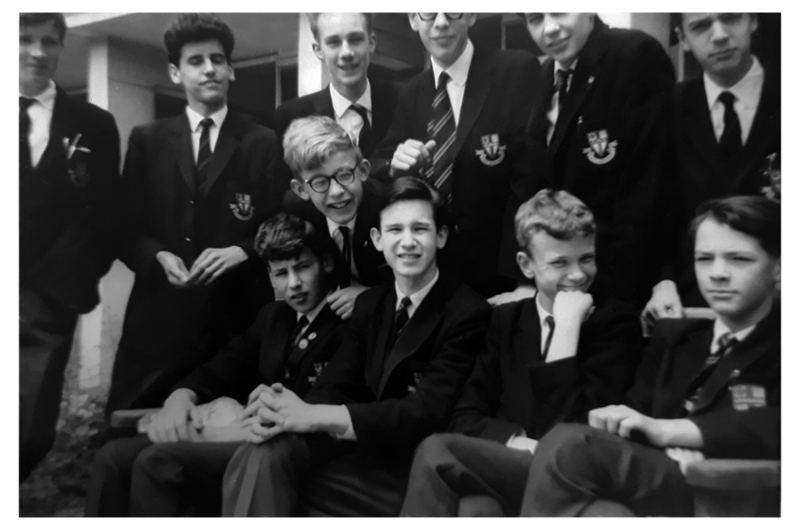 BACK ROW: Richard Humphries; Rodger Holcolme; Andrew Robertson; unknown; unknown; Francis Harrison (? ); unknown; Paul Graham. 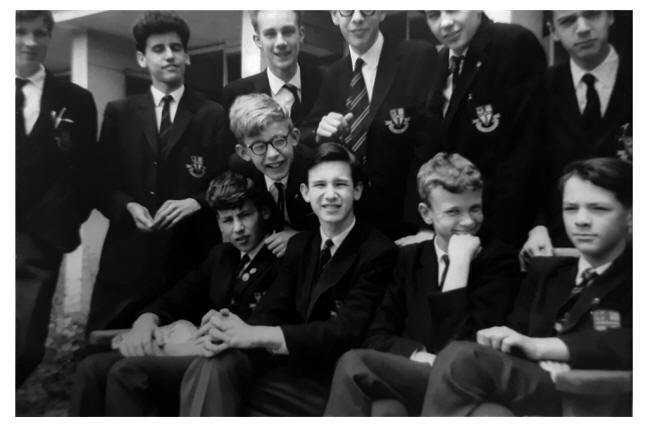 MIDDLE ROW: Roger Searle; Bob White; Derek Smith; unknown; unknown; unknown; Kenneth Collins; John Melton; Kenneth Grant; Malcolm Lyons; John Byford; John Shrimpton; Mr. Hancock, form master. FRONT ROW: unknown; Stephen Rawlings (? ); Roger Hall; unknown; unknown; Robert Seward; Julian Smalley. BACK ROW: Geoffrey Farmer; Mel Lambert; John Heslop; Michael Hollidge (? ); Peter Tomkins; Stephen Lander. FRONT ROW: Derek Smith; John Byford; Roger Searle; Julian Smalley; Paul Graham. BACK ROW: unknown; unknown; unknown; unknown; unknown; (Looks like Francis Harrison); unknown; Paul Graham. MIDDLE ROW: Roger Searle; unknown; Derek Smith; unknown; unknown; unknown; unknown (Kenneth Collins); unknown; unknown; unknown (Lyons); unknown (John Byford); unknown; Mr. Hancock. FRONT ROW: Martin Loveday; unknown; Roger Hall; unknown; unknown; Robert Seward (? ); Julian Smalley. Paul Graham (JRGS 1959-66) adds: Both photos are new to me as well. Thanks, Roger, for unearthing them. Could the missing 5U name be Michael Hollidge? Re: the 1H photo: Back row, second from left is Roger Holcombe; Middle row: 9th from left is Kenneth Grant, 10th from left is Malcolm Lyons, 12th from left is John Shrimpton; Front row: second from left is possibly Stephen Rawlings, 6th from left is definitely Robert Seward. One thing I am sure of is that the 5U quadrangle photo wasn’t taken on a Friday lunchtime. We wouldn’t have looked so carefree with Mr. "Rhino" Rees’ double Latin looming! Mel Lambert (JRGS 1959-65) adds: The lower 5U image is charming and just as I remember several participants. Julian Smalley, in particular, had a wicked smile, I recall, while John "Biffo" Byford was always up to mischief! I also note that several of us are wearing the new-style school badge on our blazer top pockets, while Paul Graham looks to be sporting the older, square design. Also, one or two are sporting the newer, wider ties - Terylene? - and others (myself included) favour the older, slimmer version with a more narrow stripe. Does anybody recall who the photographer was? Roger mentions Tommy Thompson, which doesn't ring any bells. Grant Harrison (JRGS 1959-66) adds: Absolutely fascinating! I was in 1G so not all the faces are familiar. I agree with most comments so far. Definitely Francis Harrison, as we were often confused. How about Michael Horner for middle row 8th from the left? Stephen Rawlings and I used to go home on the bus together when we both lived in Croydon. Ken Grant and I were friends when I lived in Addiscombe. His dad was a POW after Dunkirk, and we had a mutual friend in our year, Glyn somebody? He was often called "Ernie" as he was believed to only have one testicle after an incident with a bicycle saddle. Can anyone verify this! Good to hear from Roger Searle, who might remember that he and I stayed at the same house during the French trip, and even shared the same bed. I will keep looking at the photo and come back if further enlightenment occurs. Colin Taylor (JRGS 1959-64) adds: Looking at the top photo of 1H, I think the two tall boys either side of Roger Holcombe are Richard Humphries (left) and Robertson (right). Keep up the good work!